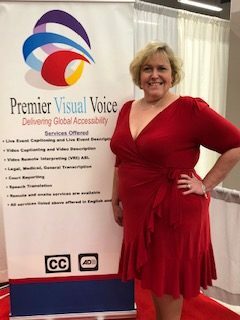 Margaret Downs is the President and CEO of Premier Visual Voice. Established in 2011, Margaret’s company provides accurate, live event captioning and CART services through both voice writing and steno-based captions. Margaret has been a user of StreamText from the start of her captioning career. Margaret shared, “After my training in school, I was looking for work. I was on the NVRA website and I saw an ad from a company looking for voice writers. I applied and tested with the owner and got the job. A few weeks later, my new boss sent me an email with a link to the StreamText website. He wrote, ‘Here’s a link to the company we’re going to use to stream your captions to the Internet. Learn it like the back of your hand.’ So I did.” Margaret’s first event using StreamText was for a deaf client located in the San Francisco area. She used Dragon to provide voice written captions. What makes Margaret’s story as a voice writer unique is that she is legally blind and has been since childhood. She was diagnosed with glaucoma in elementary school and underwent the first of several eye surgeries at the age of nine. Her sight was severely limited throughout high school and her 20s but began to drastically decline in her 30s. Margaret shared that it was time to start pursuing a new career with her vision rapidly declining. “At first, I started with medical transcription. But I wanted more diversity in my work. So, I went back to school in 2008 and started a whole new career.” Margaret also shared that the year she started training to become a voice writer was also the same year her son started kindergarten. “We both started school the same year.” Her son, Alan, now 14 years old, was also diagnosed with early signs of glaucoma. But his vision has not been affected and is undergoing consistent treatment and monitoring by an ophthalmologist.